The swimming competition will have to following for men, women and youth. 2. The age category of competition for relays will be determined by the younger age of the swimmers on the day of Opening Ceremony – July 18, 2020. Competitors will compete in their own gender, age category and division. All events will be timed finals. When there are multiple heats in an event, the ranking of the competitors for medals will be based solely on time. Medals will be awarded to first, second, and third in each event to Division 1 and Division 2 athletes by gender and age group. 1. 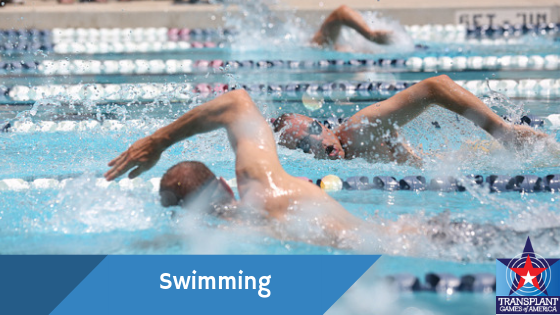 Swimming staff may combine events/divisions based on schedule and number of competitors. This will not affect medal award categories. 2. Flotation devices will be allowed for children 5 & under. 3. Team captains may NOT submit relay participants that are not pre-registered for scheduled relay event. 4. Children under 14 cannot mix with adults. 5. Swimming staff will be responsible for queuing competitors prior to the scheduled heat and will direct athletes to the start lane. 6. The pool is 25 yards in length. 7. For the mixed relay, there can be no greater than 2 males per team. United States Masters swimming rules apply (www.usms.org). With some modifications. Once an event is completed and results are available, swimming staff must record all competitors and times/scores to the appropriate system/documents. When electronic scoring is being utilized a manual backup system must be in place to record results.